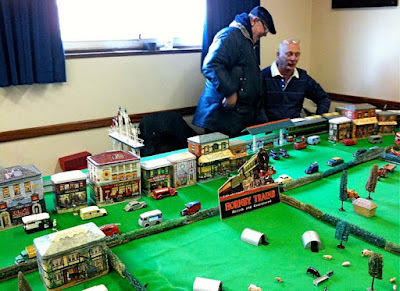 The SMN crew chanced on a collector fair a couple of days ago, at Kidlington, near Oxford, UK. 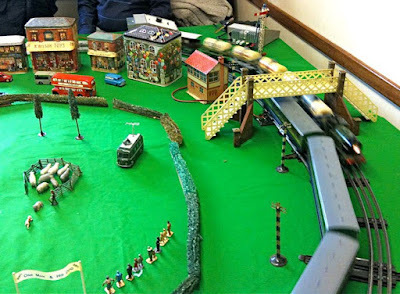 There was a strong emphasis on model trains, mostly the 00 gauge preferred by UK enthusiasts (how we wish the UK was in line with the rest of the H0 world!) but there was plenty of variety there - diecasts old and new, and even a sprinkling of one of our personal faves, collectible robots and spacecraft from TV science fiction series. 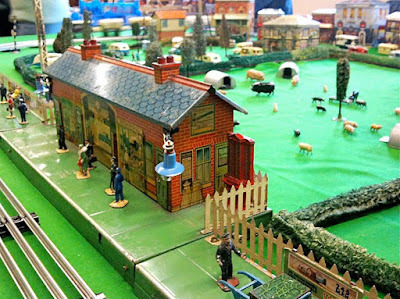 But star of the show just had to be the splendid O gauge three-rail electric layout. Of course, items like this are hardly ‘true scale’ - they are (or were) a half-way point between a non-scale ‘toy’ and a true-scale ‘model’, and once you get over being upset that creations like these are not in the same accuracy league as a modern 1:43 diecast vehicle or a 1:48 aircraft kit, then you can enjoy them for what they are - immensely pleasurable objects, which also have the benefit of action, controllability, and the roar of metal wheels on metal rails. Much the same goes for the trackside accessories - here for example, the buildings were mostly re-used decorative biscuit boxes, and very fine they looked too. The station is an original piece of tinplate railwayana though, and looks terrific, as does the tin platform, here sleek and shiny, unlike the real thing. 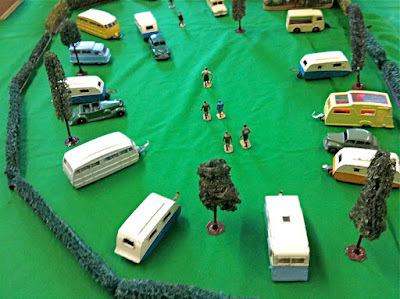 The miniature scenes beloved of rail fans were present too - here a busy caravan rally, there a sheepdog trial. 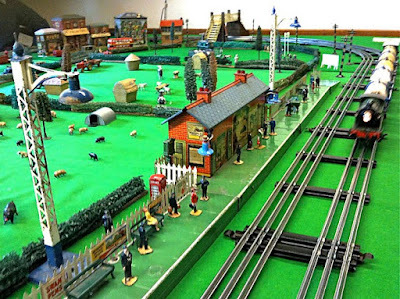 All in all, the layout was a real blast from the past, and one that could encourage any nostalgia buff to invest in the past - with an eye on the future, in the form of steadily increasing values.